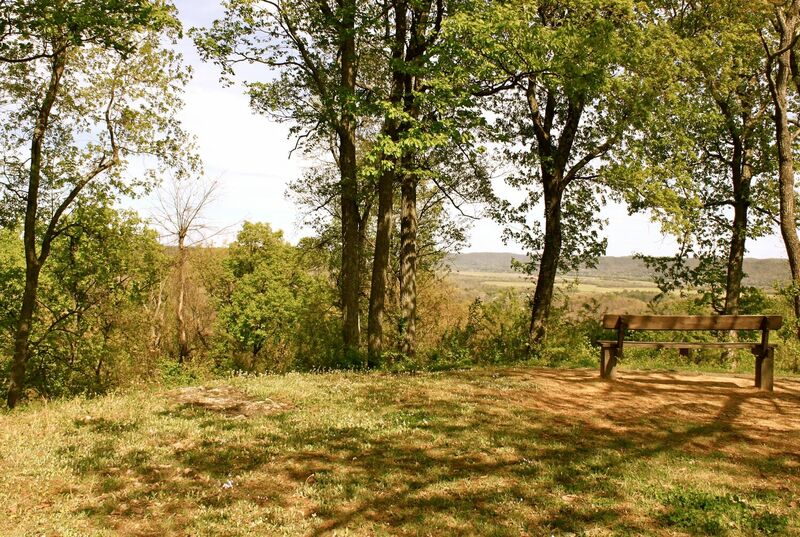 With a spectacular view of the Ohio River, the hills of Kentucky, and the City of Portsmouth, Picnic Point in the Shawnee State Forest offers visitors a memorable experience. 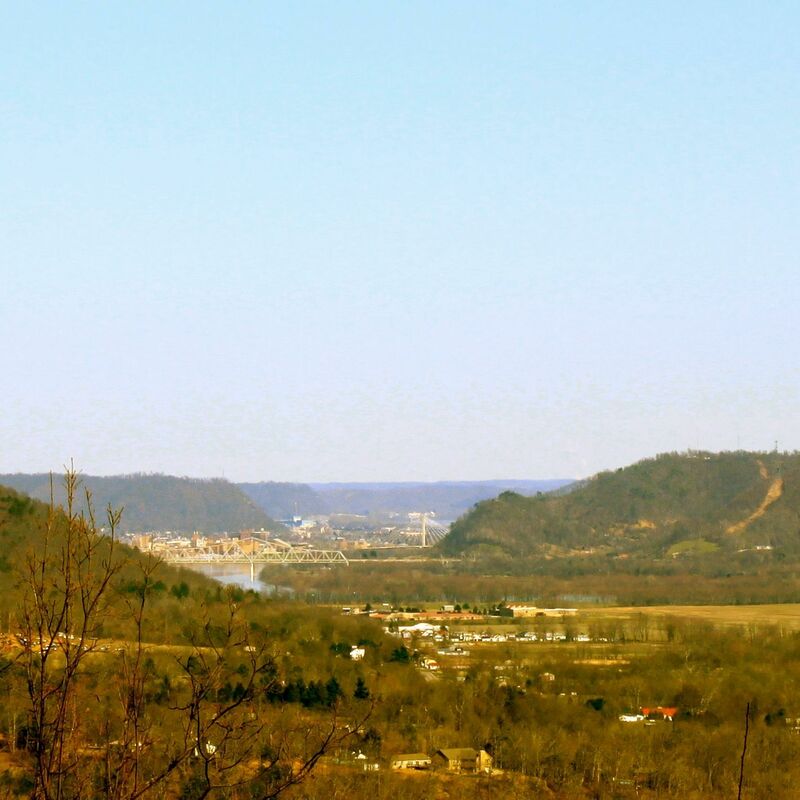 While there are a number of dramatic overlooks of the Ohio River found throughout the region, Picnic Point is the only one that is easily accessible by automobile. In the mid-1930s the Ohio Division of Forestry, with the assistance of the Civilian Conservation Corps, built Forest Road 9, from Pond Lick Run up to this dramatic ridge-top point. They cleared this spot and placed a picnic area in the center of a roundabout. The CCC enrollees from nearby Camp Shawnee No. 1 constructed wooden picnic tables, benches, and did stonework for a grill & fireplace. After the construction of over one-hundred miles of “all-weather” forest roads, the state promoted the region as "Ohio's Little Smokies" and Picnic Point originally served as a major attraction for area residents and tourists. The Point’s remote ridge-top location exemplifies how the original vision for the Shawnee State Forest was grounded in recreational and tourist uses. The new forest roads, built by the CCC, were certainly meant to assist in fighting forest fires, but a case can be made that they were also meant to generate auto tourism for Portsmouth, Scioto County, and the larger region of southern Ohio. The view from Picnic Point, with Portsmouth in the distance, can help a visitor gain perspective on the extent of state owned land in the forest and allows those who stop here the opportunity to contemplate what role recreation and tourism have (and should) play in the management and development of state owned forest lands. There has always been tension within Ohio, as well as within Federal, public land management policy, a tension that dates back to the earliest days of the conservation movement in the late nineteenth-century. That is, to what degree should state lands and their “natural resources” be managed for so-called “wise,” efficient, and sustainable commercial use (such as for logging) versus for human outdoors recreation, the protection of wildlife, and the preservation of wilderness areas, guarding these lands and the flora and fauna found therein from the disturbances of human activities? From the 1920s through the 1960s, the State of Ohio encouraged the use of Shawnee primarily for recreational and tourist purposes. Beginning with the Roosevelt Game Preserve, the state promoted the “Little Smokies” to hunters, who began coming to Shawnee in large numbers in the mid-1930s when the first deer seasons were established by the Division of Conservation. At the same time, the state with the assistance of the CCC built Roosevelt Lake and the original infrastructure for Shawnee State Park. The new improvement was conveniently located along the side of State Route 125, deep in the heart of state owned land, near the popular Boy Scout Camp Oyo on Turkey Creek. Construction of the park was the first CCC project proposed by Ohio officials in 1933 and its aim was to improve the Forest for recreational uses. In 1964, various Ohio newspapers ran a series entitled, “Let’s Explore Ohio State Parks.” The Shawnee edition, which appeared in late August and early September, featured a panoramic photograph of the view from Picnic Point, and it emphasized how beautiful the forest looked with its autumn foliage. Produced with the assistance of the Division of Forestry, the promotional copy read: “Within the southernmost loops of the Ohio River lies a vast wooded area known to many motoring tourists as ‘Ohio’s Little Smokies.’ Particularly in the Fall do these hills take on the hazy blue tinge associated with the most southerly mountains of Tennessee and North Carolina. This view in the 35,000 acre Shawnee State Forest is typical of the easily accessible area just west of Portsmouth. Nearby is the Theodore Roosevelt Reserve with another 11,000 acres of wooded hill country. This whole big area in southern Ohio is rapidly becoming a vast outdoor playground which is almost unchanged from the day of the Shawnee Indians and the Moundbuilders before them. In the Fall of the year, the oaks, maples and poplar trees give this hill country a splendid cloak of color which attracts photographers by the thousand." Today, the Ohio Division of Forestry has a stated mission: “To promote and apply management for the sustainable use and protection of Ohio’s private and public forest lands.” Striking the proper balance between “sustainable use” and the “protection” of “forest lands” remains the greatest challenge for state officials and the point of greatest controversy. Picnic Point makes a perfect stop for any auto tour of the Shawnee State Forest, indeed that is its original intended use — a tourist attraction, easily accessible by car or truck, just a short distance from Portsmouth, Ohio. Floyd Barton Chapman, "The Development and Utilization of the Wildlife Resources of Unglaciated Ohio," Ph.D. Dissertation, The Ohio State University, 1938. 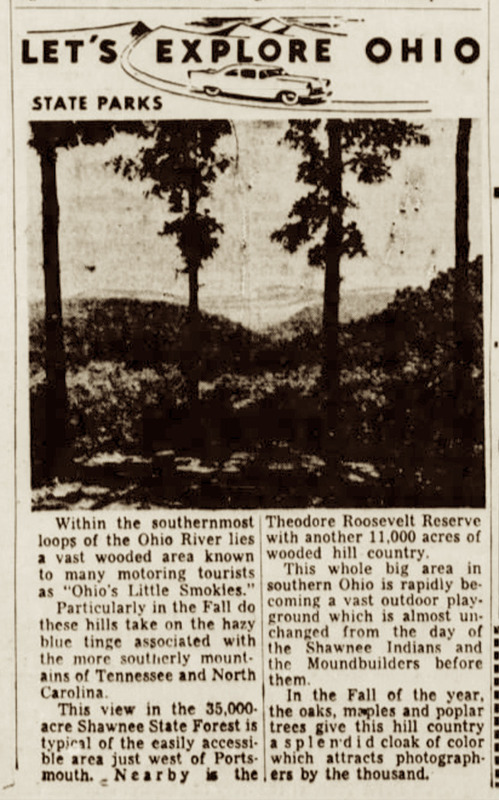 “Let’s Explore Ohio State Parks,” New Philadelphia Daily Times (1 September 1964). “Trout Derby to Be Held in May,” Hillsboro Press Gazette (17 March 1967). View of the City of Portsmouth from Picnic Point, Shawnee State Forest, Scioto County, Ohio (2012): Image courtesy of Andrew Lee Feight, Ph.D., from the Scioto Historical Series, private collection, Friendship, Ohio. 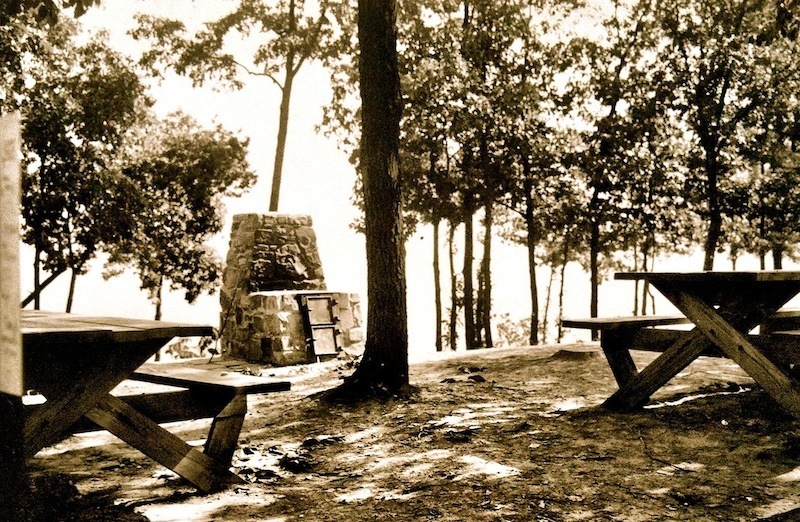 Picnic Point, Shawnee State Forest, Scioto County, Ohio (c. 1938): Photo credit: Floyd Chapman, "The Development and Utilization of the Wildlife Resources of Unglaciated Ohio," Ohio State University, Ph.D. Dissertation, 1938. 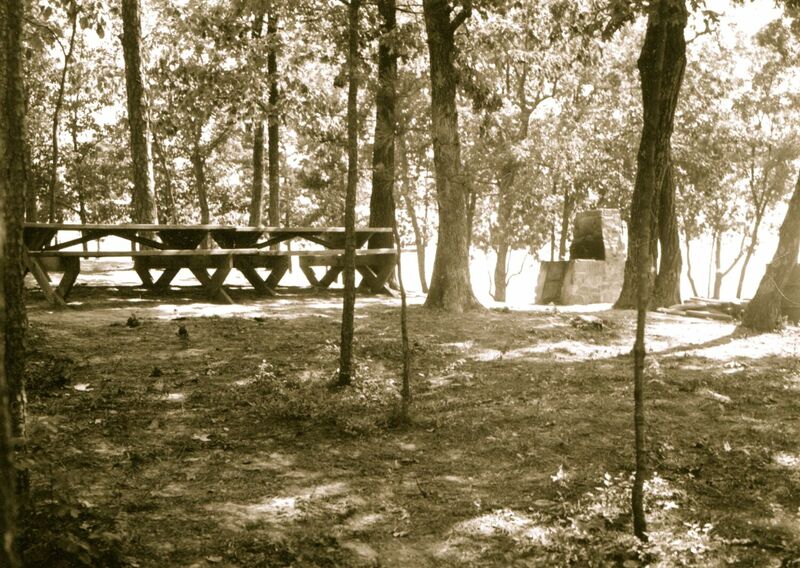 Picnic Point, Shawnee State Forest, Scioto County, Ohio (2012): Image courtesy of Andrew Lee Feight, Ph.D., from the Scioto Historical Series, private collection, Friendship, Ohio. 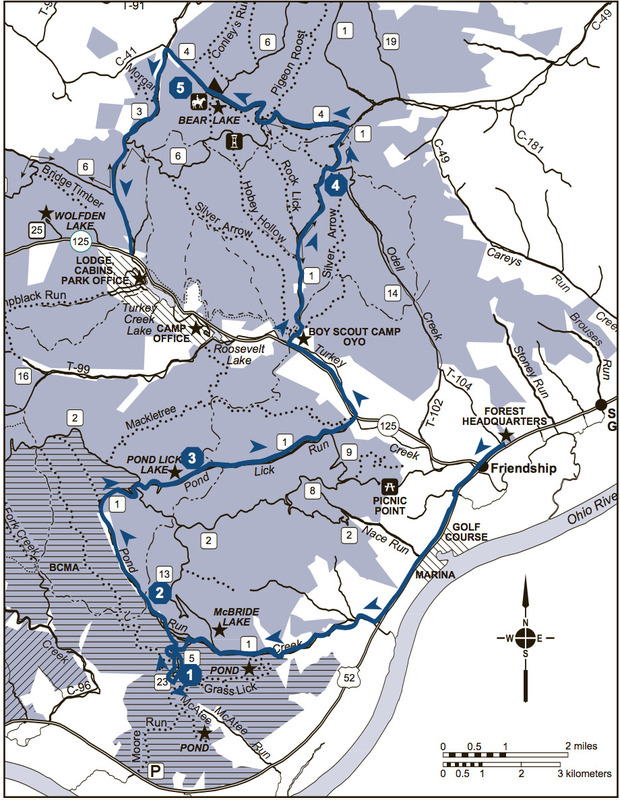 Division of Forestry Map for "Self-Guided Auto Tour of Shawnee State Forest." ~ Source: Ohio Department of Natural Resources, Division of Forestry, Columbus, Ohio. Andrew Feight, Ph.D., “Picnic Point & the Promotion of Auto-tourism in Ohio's Little Smokies,” Scioto Historical, accessed April 24, 2019, https://sciotohistorical.org/items/show/22.